Before punk broke loose, there was Graham Parker. He mixed his love of ska and soul with a pub rock sound and helped pave the way for a long line of others. After disbanding back in the 80’s, the band recently reunited and are releasing their first album in 30 years, Three Chords Good. 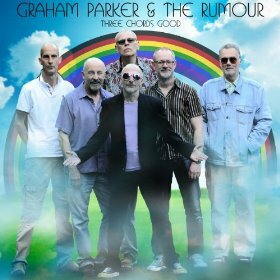 While I’ve always appreciated Graham Parker & The Rumour, I haven’t listened to them in the past very much. But after getting hooked on some of their new songs, which are featured in Judd Apatow’s most recent film, This is 40, I followed up on what I’d been missing. The new album quickly makes an impact with its writing and laid back production, which feels like an intimate, live show. The 12 songs are eclectic in form and feature content dealing with some modern issues, like abortion and war, in interesting ways. It starts out with “Snake Oil Capital of the World,” which shows off their relaxed, spot-on playing and a taste of their attitude. The songs feel familiar and are easy to listen to. The lyricism grabs your attention on songs like, “She Rocks Me,” which has a Van Morrison-meets-Dylan-and-Dire Straits vibe and “Stop Cryin’ About the Rain,” which is one of the favorites. Some of the other highlights include the title track, the wonderfully moody “Old Soul” and the poignant “Arlington’s Busy.” After listening to the new album a few times, I’m kicking myself for not going out and finding their music sooner. So learn from my mistakes and check it out now.